Recognizes the D1 domain of an N-glycosylated glycoprotein of 120 kDa with intra-chain disulfide bonds, identified as CD50 or ICAM-3 (Leucocyte Workshop VI). Recognizes the D1 domain of an N-glycosylated glycoprotein of 120 kDa with intra-chain disulfide bonds, identified as CD50 or ICAM-3 (Leucocyte Workshop VI). CD50 is the major ligand for LFA-1 (CD11a/CD18) and may have signaling role to increase adhesion. 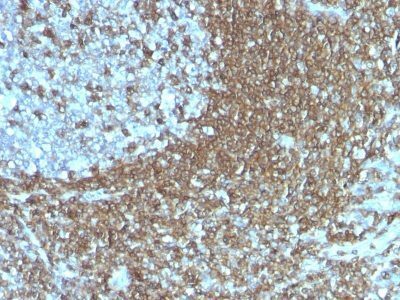 It is expressed on thymocytes and T lymphocytes and is resistant to treatment with phosphatidylinositol (PI) phospholipase C. This MAb is excellent for staining of formalin/paraffin tissues. Catalog number key for antibody number 0178, Anti-CD50 (186-2G9) The prefix indicates conjugation, followed by the antibody number and size suffix.